based in New York City. 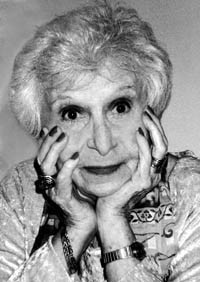 Lerer appeared opposite every major Yiddish theater actor during her career, which lasted 90 years. Also, she was cast in film roles, which included the 1997 Woody Allen film, Deconstructing Harry. Her father, a manager at a soap factory, had immigrated to Argentina from the Russian Empire to escape anti-Semitism and poverty through the sponsorship of philanthropist and banker, Maurice de Hirsch. Lerer was born in the Santa Catalina colony in Argentina on August 30, 1915. Shifra Lerer was married to Ben-Zion Witler, who was a Jewish singer, actor, coupletist, comedian and composer 1907–1961 . She was born in Belz (Galitsia).